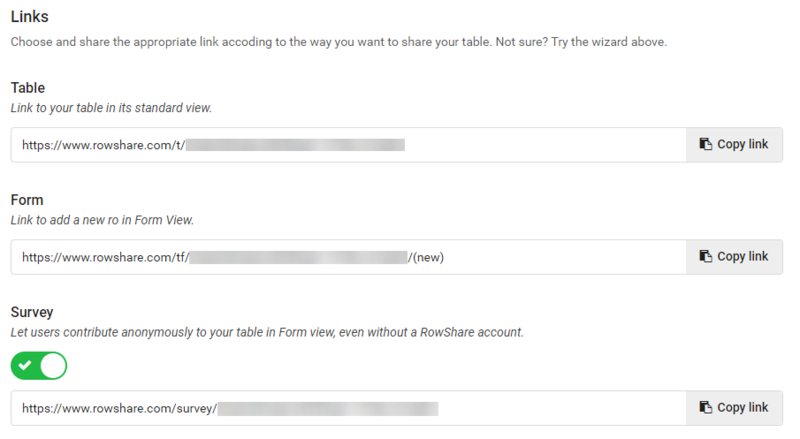 Activate RowShare Survey Mode on your table to offer other users a way to enter information in a form without having a RowShare account. Once you activate the Survey mode on a table, anyone clicking the survey mode link will access a one page survey. Upon clicking on the Save button at the bottom of the form, their answer becomes a new row in your table. Survey responders can not change their answer anymore after hitting Save. It guarantees that even if they use a RowShare account, their contributions to your table will remain anonymous. 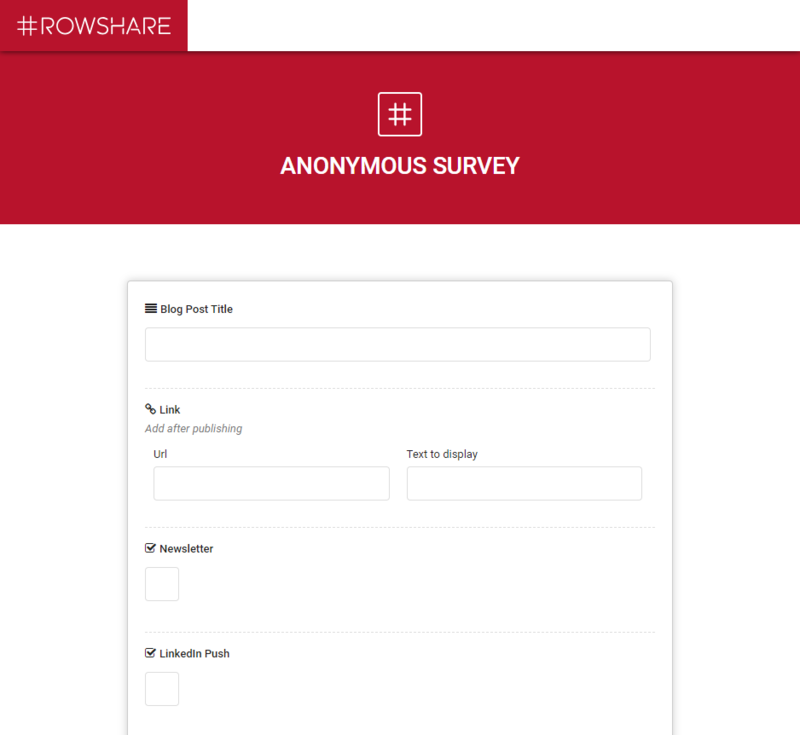 If you need to gather data anonymously, or if you can't afford to ask your users to create a RowShare account (even free), activate the survey mode for your table by clicking on Share. By default, the Survey Mode is not activated to guarantee so that each row is owned by its creator. You decide who can view or edit your table. The first time you click on this button for a given table, a wizard helps you decide how you want to share your table and offers one sharing link based on your answers. Click on Sharing Settings at anytime to access all links described below. Survey Mode functions regardless of your table permissions. If you activate Survey mode, respondants will be able to fill the survey even if the underlying table is set as read-only. Here is an example of RowShare Survey form. Of course, as the survey is anonymous, the rows created in your tables by the Survey mode do not have an owner. Their row owner initials show a spy to convey the idea that no one knows who created that row. Similarly, the Row Owner and Row Owner Email columns show survey@rowshare.com. You can then assign the row to someone.